Following up on my recent post about vintage Waverly rhino cloth, Addrienne sends along this exquisite find — sure to make many readers envious. sealed the deal on the purchase of my new house. I am writing to you to share one of the best thrift store finds ever. 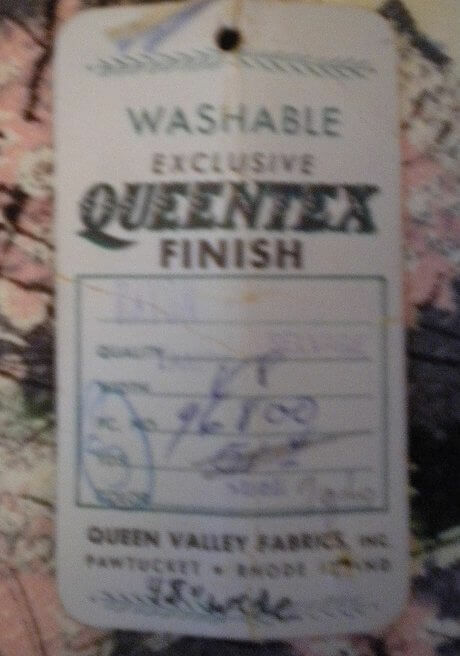 A while back I came across a whole bolt of Waverly fabric. I believe it is Rhino cloth from what you described in your recent post. 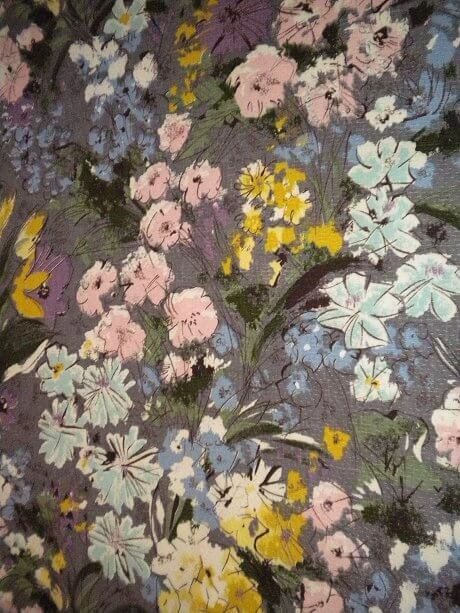 It is a floral print with a gray background and I have approx. 8 yards of it. 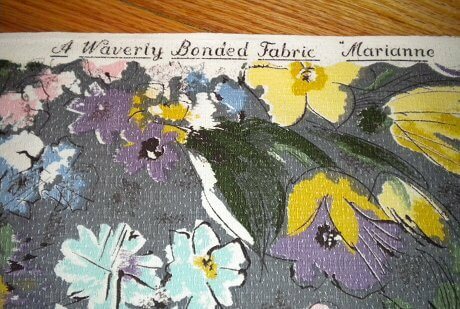 The label on the selvedge says that it is a Waverly Bonded fabric, and the name of the print is “Marianne”. Eventually I am going to use the fabric to make curtains for my sewing room, but I would love to send you a swatch of the fabric. Thank you for all of your great articles and resources. I hope to share some pics of my pink bathroom with you once I have got it all fixed up! Thank you, Addrienne, for sharing this with us. I have to say — it’s really wonderful to see that explosion of color. The lavendars and yellows, in particular, are very refreshing. And, it’s interesting to see how allthe colors come together so beautifully against the background of medium-gray. I agree with you: We’re calling this rhino cloth! You gotta tell us, dear, though: How much $? I’ve recently realized that I think I have some vintange barkcloth/rhino cloth pleated draperies on my hands. A friend of mine who caters a weekly auction house and has a basement full of vintage treasures gave these to me several years ago. I was so excited to receive these but never really knew what I had..until now. They are quite expansive and must have hung on an enormous picture window of some sort. They are also lined. They are a bit yellowed from age and/or cigarette smoke exposure and don’t smell as fresh as one would like. What would be the best way to clean these? Maybe a gentle cold water soak in a bathtub of Woolite? I’ll send Pam some pictures to post as soon as I can locate the box they’re packed in. Aaaah! The colors of this are gorgeous! I would have paid a pretty penny for 8 yards of it! You will probably cry when I tell you this, but the fabric was actually picked up by a friend of mine first. But because she knows that I love all things old she gave it to me. Cost to me was $0. The retro gods must have been looking after me that day hahahaha. No, Addrienne — we are cheering for your great find/gift, not crying at all! hooray!